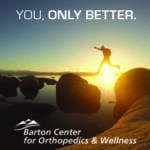 The Barton Center for Orthopedics & Wellness is committed to treating the entire patient and not just the injury or symptoms. The Center houses our orthopedic services, rehabilitation, performance training, wellness programs, and community events. This diversity allows you to explore a variety of programs and services to improve healthy activity and quality of life. Care coordinators are available to assess your current state of health and well-being, determine your goals, and develop an actionable program helping you achieve your health goals to become the best version of yourself.